For many heart-eyed romantics (and enthusiasts of confections), this Valentine’s Day is going to look, taste, and read totally different than those past. That’s because there will be no chalky, dry, and quite-nearly tasteless Sweethearts to consume this year. But before you totally short-circuit at the notion of actually needing to vocalize the words “BE MINE” this year, know that the hiatus in production is set to only affect the 2019 holiday. It’s all due to a change in hands of Necco and Sweethearts brands; the Spangler Candy Company (AKA the Dum Dums guys) acquired the brands in mid-2018, which brought about some supposed manufacturing issues responsible for making this February 14 a conversation-heartless one. It’s good news for Brach’s, though, which is pushing out its knockoff conversation hearts right on schedule. Sure, I’ll acknowledge the obvious hypocritical nature of pulling a “WHO CARES” dismissive as a lead-in for an entire piece of content outlining why I don’t care (which, it could be argued, means that I in some way do kind of care), but it’s the knee-jerk mood here. Valentine’s Day—the holiday of saccharine prewritten remarks in Hallmark cards, overpriced prix-fixe dinners, and stress—is solely redeemed by its candy. Though I’ve never known anyone to genuinely swoon over a box of Russell Stover chocolate, there’s a comfort in knowing that the nonsense will be at least 30 percent off February 15th. And if you’re feelin’ real quirky, maybe you’ll pick up some heart-shaped lollipops or IDK, a pack of candy-and-card Nerds. But conversation hearts? My God, who cares? Do you actually enjoy the taste of conversation hearts, or could it just be the potent power of nostalgia at play? If you do feel personally affected by this plight, take stock in why it’s making you feel slighted. Is it because you actually enjoy the taste of the stuff? Or could it just be the potent power of nostalgia at play? That’s why, after all, Halloween candy tastes so good and why pumpkin-spice anything is kryptonite as soon as fall hits. When you bite into a conversation heart, perhaps you remember a time when Valentine’s Day was fair—like in second grade, when everyone in class got the same candy and messages—instead of now, when it’s just a long social media feed of disgusting “#blessed” gooeyness and bitter memes in equal measure. Now respectfully, I get the escapism; sometimes everything in the world just kind of feels awful. But let’s not use rose-colored lenses to romanticize conversation hearts, a candy that has the sole redeeming quality of being three calories a pop. 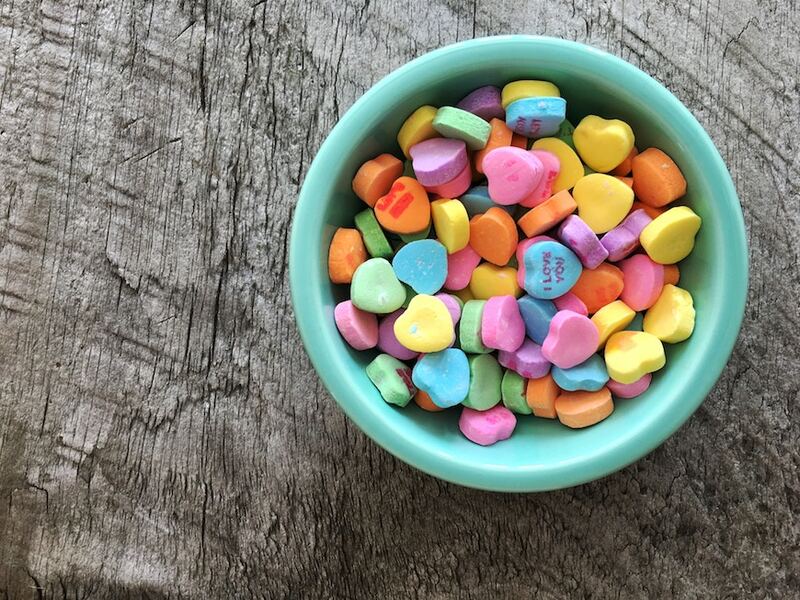 From a taste perspective, the defining flavor and consistency of conversation hearts has always been “chalk.” But the most befuddling thing to me is how they’re flavored with the least savory of choices. Grape? Banana? Only tastebud-less fools would contend banana is a solid “yellow” when citrus-y options exist (you can @ me for stance—I’ll hold firm). And from a conversation perspective, the hearts truly and emphatically don’t know what they’re talking about. With that very limited space, they manage to spout objectively stupid lines like, “BE GOOD,” and “SWEET TALK” and “U R CUTE” You know what? If you’re not Prince, I don’t want you that kind of language in my household. In the absence of conversation hearts, don’t you think we can muster the strength to simply talk to each other with our own voices? Likewise, they’re always very aggro about wanting to keep in contact. One of the most famously outdated heart slogans is “FAX ME,” which begs the question of who the hell was ever flirting via fax? So many things could go wrong there! It’s so easy to read a flirt fax not meant for your eyes! Anyway, I digress. There are more contemporary messages, communication-wise, like “CALL ME” and (gross) “TWEET ME.” But, c’mon, you guys. In the absence of these verbal cues, don’t you think we can muster the strength to simply talk to each other with our own voices through means we come up with ourselves? We can still preserve our sense of agency and free will for interpersonal communication, after all. It’s fair to argue that conversation hearts are a necessary evil, because something always has to be the weakest link of a holiday’s candies. Halloween has candy corn and its pumpkin-shaped cousins. Easter has Peeps, (which you might say aren’t gross, but just think about dipping a lump of marshmallow in sugar—disgusting). Winter in general has candy canes, and those are pretty awful, if not just needlessly sticky. But these things remain constant because we’re creatures of habit, and nostalgia is a powerful flavoring. So, especially since they’re slated to return to shopping aisles by 2020, I’m sure we’ll get through the Great Conversation Hearts Shortage of 2019. But for those of you reeling in withdrawal pains, I’ve got a vintage three-pack of Sweethearts in my desk from two years ago, which is still grossly within its shelf-life. The bidding price starts at $300. Your move, America. Regardless of your relationship status, do yourself a favor and get one of these hilarious Valentine’s Day cards. And here are some non-cheesy ways to decorate your home for the occasion.